I know, I know, that sounds like a particular seasonal car commercial. But we really did have a great November meeting, made so especially by some surprise guests. Well, who is this handsome young fellow? This is the grandson of Chris, the owner of the Sports Bar & Grill. Those are real cars. The boy is 219′ tall. Kidding! Big Tractor Mike RAOK’d the young’un with a pack of Micro Machines. Not sure, but these just *might* be NASCAR-themed. Here’s another reason our November meeting was special: I brought cars! It’s been a looooooong time since I did. But I dug out a bunch to hand out during Halloween (yes, with candy). I had 48 candies (24 of two kinds), and 24 cars. These are the cars I had left over at the end of the night. I took the leftover candies to work, in case you’re wondering. Spare Mike had this sweet, sweet ’33 Plymouth PC Sedan. This is one beautiful classic cop car. The simple monochrome paint with black fenders and chrome highlights just works. I swear, this looks like it just rolled out of a James Cagney movie. This is a very special build. It’s another custom by Doug, of course, but this isn’t just any old barn. 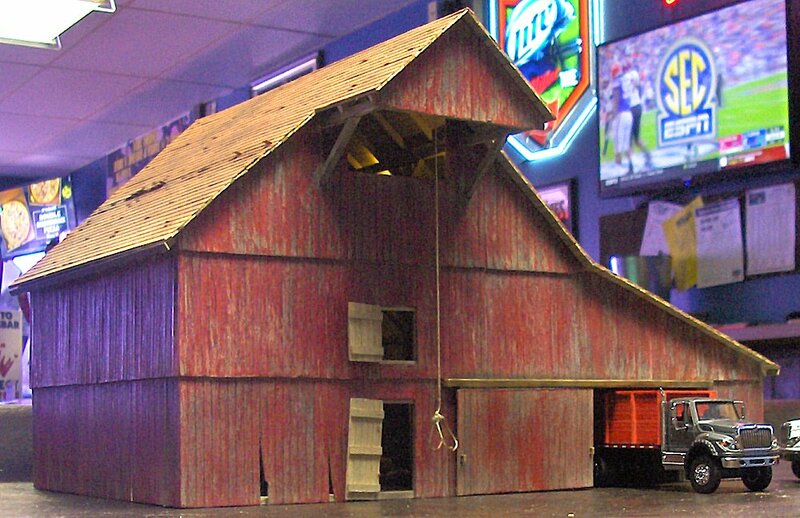 This is an exact replica of Spare Mike’s grandfather’s barn. I can tell you, Spare Mike was quite moved as he looked over the model. Please enjoy this larger image. Here, Original Ken takes a few photos to post to Suncoast Diecasters‘ Facebook page. The biggest surprise at our November meeting was the visit by two nice Canadian ladies Big Tractor Mike while operating a booth at the ’49er Flea Market. They specifically scheduled their next trip to coincide with our meeting. Here aer just some of the vehicles they bought. I selected a few of their assortment to showcase. Here is a 1/87th-scale caravan by Eko, with the classic teardrop shape. Next to it is Matchbox’s Flying Bug. This orange one is apparently the only variation MB ever offered (even though the wiki doesn’t list it). The orange isn’t a custom; I own one as well. Here we have a VW Sharan by Siku. On the right is a snowmobile. That is a nicely done bicycle. Oh, by the way, that isn’t just some “generic” snowmobile. It’s a Ski-Daddler, by AMF. I know this because the toy says so on its base. It’s by Corgi, and features WhizzWheels. For being a good representation of a particular snowmobile, for being overall in very good shape, including still having its windscreen, and for having a nicely-sculpted (and painted!) driver, I declare the Corgi AMF Ski-Daddler to be Suncoast Diecasters’ Find of the Month(*) for November 2018. …And with a couple of hours still left in November, our November update is actually published during November! Holiday celebration! See you at our December meeting!